Does sugar by any other name still taste as sweet? Just wanted to take this opportunity to wish you a happy day. Hope you have fun on your bike ride together. We will be thinking about you all day long. You are a wonderful person and a lovely daughter. You are a real blessing in our life. …and I am going to go absolutely pie-crazy. Mark mentioned “Vinegar pie”, which I recall reading about in a Laura Ingalls Wilder book–there are some recipes for it online, and it sounds interesting. I think the books also mentioned raisin pie. I might try a carrot pie sometime, and Hawaiian-style sweet potato pie. Not to mention Bacon Pie 2.0. Any pie requests? I want to get some practice in before the holiday. Once we get near to Thanksgiving, I will bake as many pies as people want. We don’t get a Preparation Day. This week we forgot to leave a day open for our preparation day. Today there is a baptism and we need to be there by 12:30 or so to make sure that all is well at the post chapel. Dad is baking brownies to take right now. We did do some grocery shopping earlier this week, but it would have been nice to be able to go on a nice bike ride today. It is really cold right now, but maybe in an hour or so it will be warm enough to ride. This has been a good week. We think there will be one more week and then the men start to return, but we don’t know for sure. Nobody knows really. They will get back when they get back. We have had a few of the wives tell us they are worried about husbands living the gospel when the guys return. We have been refering them to Ensign articles that address those fears. We tell them to be good examples of gospel living. Fall is here. We have been here for all 4 seasons. We will only have one full summer and one fall. We do get 2 complete springs (my favorite season). The down side is we get 2 winters, my least favorite season. I will plan better next time. I don’t want to leave so soon after the holidays, that was very hard. Maybe we will just do a 6 month stateside mission somewhere cool like Nauvoo. Dad is busy cleaning the floors. Guess I’d better go do something more useful. 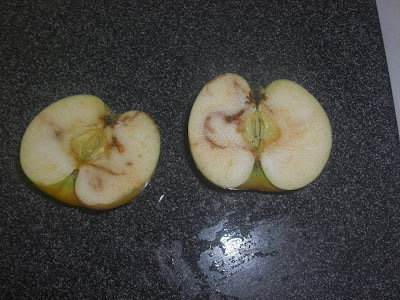 When I was a kid, and I would find an apple that was “imperfect,” Mom would tell me that when she was a girl, her mom wouldn’t let her cut the bad spots out of apples. Grandma told her that worms dig their way straight into the apples. If you just put your finger over the worm hole, you can eat the rest of the apple without worry. Grandma lied. I love “Rebirth of the Small Family Farm” by Bob and Bonnie Gregson (available at Timberland lib). They live in WA, so a lot of the information is really applicable to our climate. It also has an extensive bibliography, so a lot more reading can be done. The best information that I’ve gotten from this book so far is that you don’t need as much land as one would think. They support themselves (there are only two of them) on two acres of farmland. The only animals that they raise are chickens. We would definitely be able to find a piece of land if we only planned on two or three acres per family. I think summer is over here. It was below freezing this morning. I think our summer left us for somewhere else. We hardly had a summer. We were so worried that we would be too hot in our attic apartment, what were we thinking? Too hot? Seriously now. At least the heat has been turned on. We have glorious heat pouring out of our radiators. We even leave the radiators on while we are gone. Why not? We pay 150 euros per month year round (about $2800 per year) for heat and hot water, we will use heat during heating season. When I’ve been out in the cold all day I want to come home to warmth; I don’t want to wait for it. Earlier in the week it was around 61 degrees in the apartment. Dad complained to the landlord and we had heat. Enough whining for one blog. There is always spring and summer to look forward too. We are busy here so time passes swiftly. We had work at the library and then two good visits, two others canceled. We enjoy our work, I just enjoyed it more when it was summer time. The men will be here soon. There is excitement in the air. The men will be home from Iraq in a month or less (or more, who knows). There is a feeling of anticipation, everyone hurries. We see women coming home from the post office with huge footlockers in their trunks. Their husbands are sending home their belongings. The men will only bring home a duffle bag on the flight. We’ve had to help a woman in our ward put her husbands’ footlockers in her garage. Signs are starting to pop up around post, “you are our hero” etc. People are starting to talk about the next duty station, or getting out. Our job will change a bit when they get back, but it will be a happy change. After these guys get home we will still have 8 or so guys that will get back next August and then another group leaving sometime late fall. It seems like it will never end, that there will always be someone who goes to war.